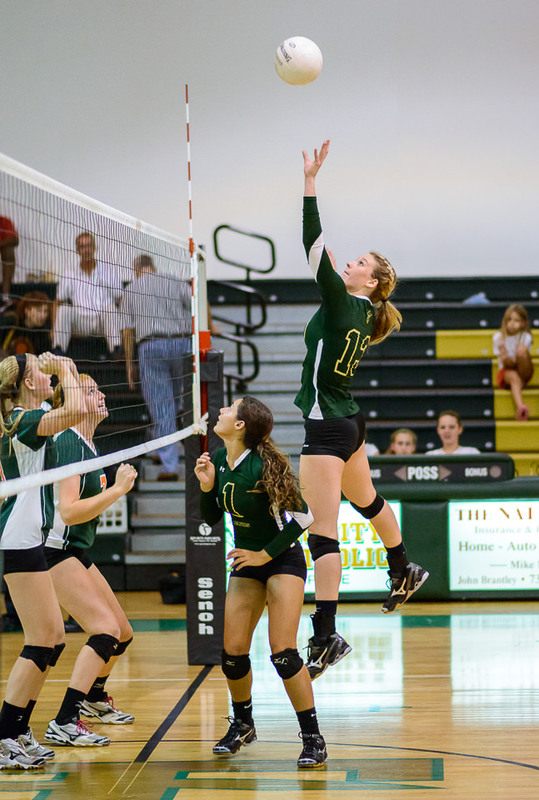 After the heat of summer, when students return to school in the United States, Volleyball is one of the sports played in the Fall season. It moves from being an outside sport, to an inside one. This is unfortunate, at least from a photographic point of view, since most High School gyms are poorly lit. However, even in these conditions, with some practice and the right equipment, you can still get good pictures. I shoot Volleyball with just one camera, concentrating on taking pictures of the team I am supporting. Past experience has taught me that the other team (school, parents and fans) will seldom, if ever, purchase pictures, no matter how much time and effort I spent on promoting such. You don’t need the ball in every shot. Due to the dark conditions, a lot of people shoot this sport with a 200mm f/2 lens. I have never owned or shot with that particular lens, and at a price of almost $6,000, I don’t plan to (unless that Lotto ticket wins or my rich uncle dies). I have, however, shot it with a 50mm f/1.8 and a 85mm f/1.8 on a D800E. Of those two lenses, I would suggest the 85mm, due to the longer reach. I have also shot it with a 70-200 f/2.8 on a D3S. While I like the extended reach of the 70-200, unless you have good light, I would suggest staying with f/2 or faster glass. 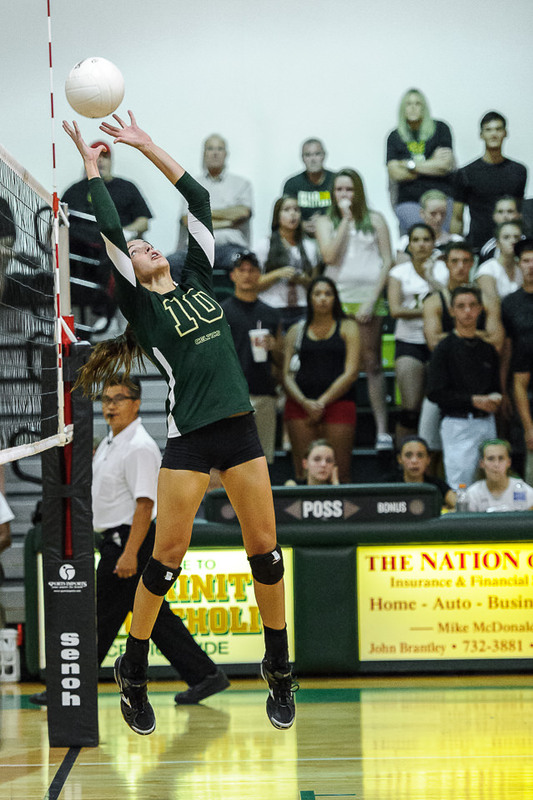 I shoot Volleyball from the stands, usually getting a seat in the first three or four rows. I sit on the end of the gym where my team is playing, switching ends when they do. I try to get a seat close to the net area (about six feet to the side of it). Note: If the gym is crowded, you may not be able to switch seats when your team moves. For me, Volleyball does not lend itself to being shot from the ends (like Basketball), nor is there a lot of benefit to moving around (like the sidelines on American Football), however you are welcome to try. Like with most sports, you want to use a quick shutter speed. However, to keep your ISO within a reasonable range, you typically can’t go too fast. If shooting f/1.4 glass, you can get away with 1/1,000th of a second, or even a little faster. With f/1.8 glass I normally shoot Volleyball at either 1/640th or 1/800th of a second. 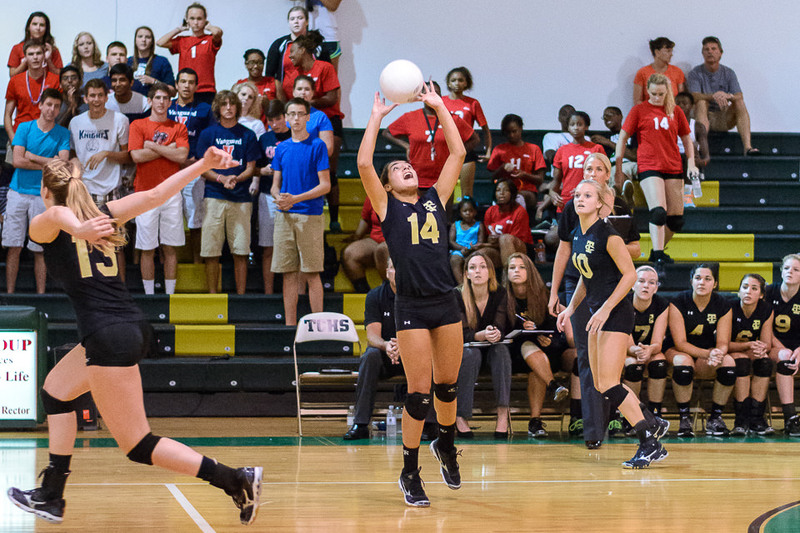 For other camera settings, see my “High School Sports Photography Tips” article. Remember, the lower the F-stop number, the thinner your depth-of-field, so be sure to have your lens dialed in on your camera. Follow the ball with the camera, that is where the action is, but keep you other eye open. Sometimes two or more players are reacting to the expected path of the ball, and collisions can occur. Be prepared to shoot in short bursts. I have my camera set on “Ch” mode, and normally shoot in bursts of two or three shots. Volleyball is a very vertical or tall sport, and is usually best shot in portrait orientation, with occasional ones in landscape. If using a 70-200 lens, be warned, there is a lot of zooming in and out involved (one of the reasons I prefer to shoot this sport with a fixed lens). When the game ends, and before switching seats, take a quick shot of the scoreboard. Since a Volleyball match is as many as five games (first team to win three games is the winner), this is a quick reference shot to use between games. The D810, like the D3S, has a native ISO range up to 12,800. For testing I restricted myself to ISO 3,200. Test shots were done with the 85mm f/1.8. I shot some at 1/640th, and some at 1/800th, of a second, and restricted the ISO range accordingly. In addition, I tested Single Point, 9 Point and Group Area AF. In a quick review of the shots, I had a better hit ratio with Single Point Focus. Group Area AF was slightly lower, and 9 Point was awful. In Volleyball people are moving around too much, sometimes blocking the person you are trying to focus on. In my opinion the focus system, if not in Single Point, can get confused as to which player to put in focus. 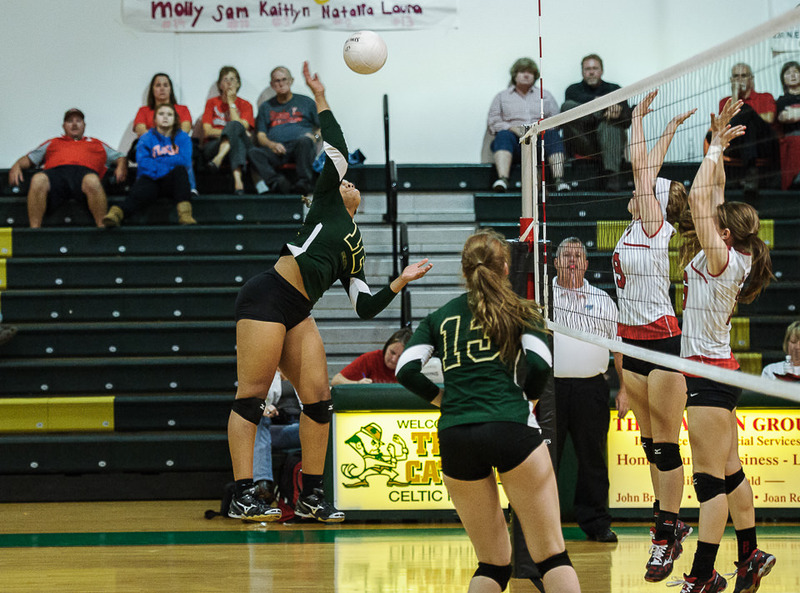 The D810 worked fine for Volleyball, with the above caveat on focus. DxO has just updated their program to include processing for the D810, so I have included a sample shot above. William Jones is a former film photographer that converted to digital about six years ago, after having taken about a 20 year hiatus from the photography game. Started serious digital with a Nikon D90, and has since owned and shot numerous different Nikon models, including a D3X, concentrating on sports. Still using some of the old techniques taught from the days of film, with an understanding of how to modify them for the digital format. A chronic sufferer of GAS (Gear Acquisition Syndrome), as his recent purchase of a D810 proves. Always looking for new sports to photograph, but with an appreciation of the beauty of other subjects. As you are moving towards cameras with more megapixels, have you noticed a deterioration in low light performance? For using a 50mm lens you must have to get quite close to the subject. Do the players ever find it distracting? Or do you just shoot from some distance away and then crop? While cameras like the D3, D4 and D4S will always be better in low light, the differences are not too bad, unless you get to real high ISO numbers. Cropping with the D800 series helps a lot, and “extends” the reach of the lens via cropping. For example, on a D4 camera, an 85mm lens produces a 16MP picture with that reach (AoV), while on a D800 series you get 85mm (AoV in FX mode) with 36MP, or 102mm (AoV in 1:2 mode) with 25MP, or 127.5mm (AoV in DX mode) with 15.5MP (almost the same MP as the D4 camera). You could always shoot in FX mode and then crop later, however if I know ahead of time that a certain portion of the pictures will always be thrown away, then when shooting a D800 line camera I “pre-crop” by shooting in 1:2 or DX mode. A personal choice (but it does have advantages of smaller files, faster FPS, bigger buffer, etc). With a 50mm lens the D800 numbers are 50, 60 and 75mm. 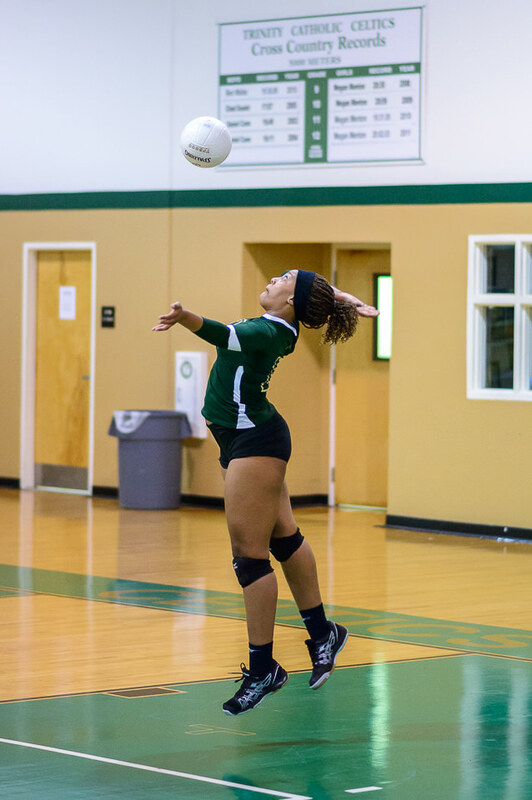 In Volleyball I normally shoot from some distance, and then crop, so I am not a distraction to the players. In Basketball I am a lot closer to the players (occasional out-of-bounds contact), but even so, not a distraction to the players. The players watch the ball and other players, not me. The latest generation high MP FX cameras (D600 line/D800 line) work decently to good in low light, though I try to never push them over ISO 6,400 (unless I don’t need to crop at all). Using f/1.4 thru f/2.0 lenses enables me to keep the ISO within such a range (with the exception of Football, where I have to use a f/2.8 lens, but still can typically keep the ISO no higher than 6,400). 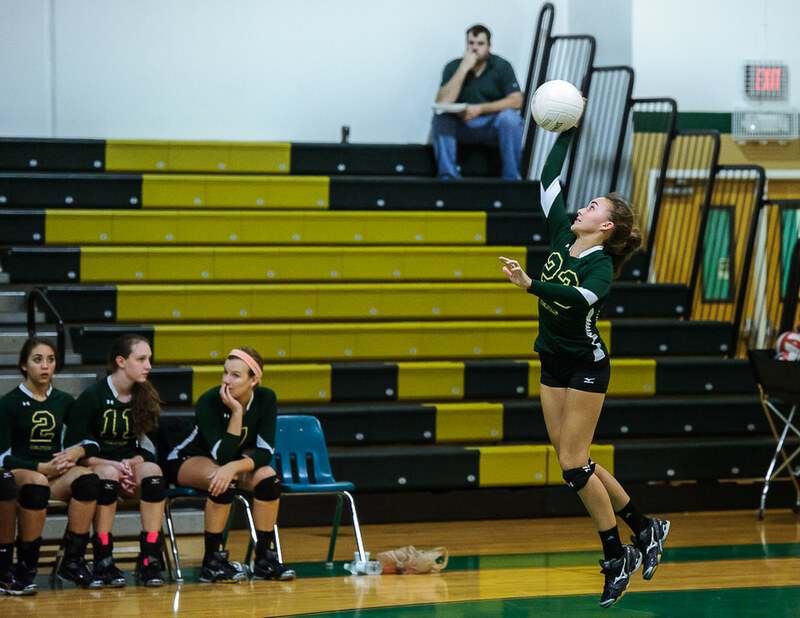 I have shot Volleyball with the 50mm lens, but prefer the 85mm (more reach). Since there is no flash, the players don’t even know I am there. I crop, a lot, but that is the nature of sports photography. I could get “closer” shots using the 70-200 lens, but that starts pushing the ISO too high for my taste. Also, I prefer “full body” shots over “partial body” shots. Using the 200mm f/2,0 would zoom me in a lot, keep me within an acceptable ISO range, however it would then take out the perspective of the full body shot. Nothing wrong with that, just a personal choice in the type of shots I like. I typically crop a little tighter then some of the above shots, but that causes aspect ratio issues, so Nasim cropped these in a more traditional manner. The real issue is White Balance. I am partially color blind, and with the poor light conditions, frequently the WB is not what it should be. I use auto WB, but that does not seem to help much. When shooting action, you move the aim quickly from point to point, and the light shifts. I have had this problem with the D600, the D800 line, and even the D3S. It is the nature of this type of photography, you can’t control the environment, so you just do the best you can. 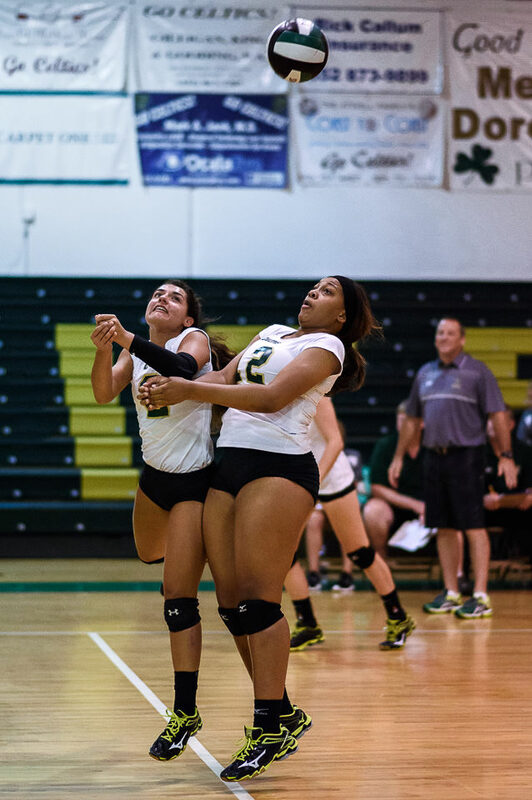 I do have some D810 Volleyball shots currently posted to my website. Take a look and let me know what you think. Mr. Jones, thank you for your article. I am looking at purchasing a Nikon 50mm lens to use with my D7100 but unsure if I should spend the extra to get the f/1.4 over the 1.8, can I get your thoughts on this? My main use will be to take photos of my daughter who plays basketball, whose games I can get up close to but are many times played in poorly lit gyms. Thank you in advance for your thoughts! Typically you can get away with the f/1.8 lens, however if the light is very bad, then you gain 2/3rds of a stop by using the f/1.4. You could try renting both a f/1.4 and a f/1.8 lens, and testing both, using different shutter speeds, and both wide open. Please be sure to AF Fine Tune both lenses ahead of time (Nasim has articles on how to do this). The f/1.4 will always allow you to use either a faster shutter speed or a lower ISO. On a D7100 the 50mm lens is a 75 AoV, while the 85mm lens would be a 127.5 AoV. The longer reach of the 85 is nicer, but the price of a 85 f/1.4 is not. However, for Basketball, you might actually want a 35mm lens (52.5 AoV). Basketball, if you want to shoot both offense and defense, is best shot with two cameras, one short prime and one long prime (35 and 85 in that order), and then crop as needed. I have a planned Basketball article as part of this series, but that won’t be published before Oct or Nov (or even later, if I wait to test the D810 for Basketball). Hope this helps at least some. Excellent tips. I would add that if anyone is having trouble nailing focus, they should try focusing on one player and waiting for the action instead of trying to follow the ball. The game is fast-paced enough that they should get in on the action pretty quickly, and by the end of the game you will be sure to have great pictures of all the players. The more you learn the game, the easier it will get to follow the ball though. I also shoot mostly from the side and close to the action. However, there are some gyms that have bleachers on the ends, and if you can get several rows back and shoot over the net with a zoom lens, you can get some pretty cool shots. If there’s a balcony, you can get a lot of interesting angles. I usually shoot the first game from a “safe” location to make sure I get what I need and then try to experiment a little for the second game. 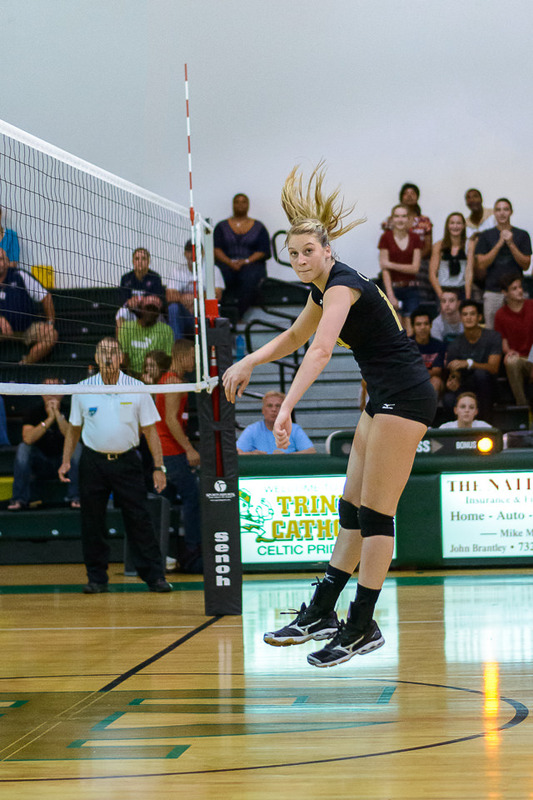 One other tip – volleyball players are some of the most expressive athletes in my experience. Don’t forgot to keep shooting after they score, because you will get great reaction shots from their celebrations. Thank you for the extra tips. The gyms I shoot in only have seats on the side, and end shots through the net I have never liked. I shot sometimes soccergames, but the problem is not the speed, its the focus. I also use single point on a D800 and I often use the Nikkor 85 f1,8g. do you use the continuous focus in single point and with 3d or how do you use single focus? By the way, I was reading the above from the D810 menu, so if the above menu option #s are different, adjust as needed. I have accidentally switched from AF-C to AF-S during a game (meant to change # of points), and did not realize this until later. The D810 has a menu option that locks out AF-S (or AF-C, your choice), so it can not accidentally be chosen. Practice with your child running around on his/her own. Follow with the camera, keeping the Single Point on the chest (largest part of the body), taking occasional pictures (can always delete). Have the child run sideways, towards and away from you, with you taking pictures every so often. Remember when you press the shutter to press it lightly, and not to push the camera down (this will cause blur). Also, shutter speed, what are you using? Even though this is only an 85mm lens, try to keep the speed to at least 1/500th of a second, and in action (as long as not pushing ISO too high) faster is better (my opinion, though some people prefer to have action blur in their photos. An artistic difference). I have shot soccer with the 70-300 f/2.8, the 300 f/4, the 85 (both f/1.4 and f/1.8) and the 50 f/1.8. Current kit is D810 with 70-200 and D800E with 50 f/1.8. Try some of the above and let me know if it helps. Note: Soccer is one of the planned sports for this series of articles. Thank you very much for your detailed reply. I really appreciate it. Normally I single point AF-S, but I will now try with AF-C. I also used to set the camera mode to “S” mode and set the shutter speed to about 1/500 and iso adjusted based on these settings and conditions, whether it is inside or outside, dark or light. But it is first and foremost focus I have struggled with most. If you were shooting action with AF-S, then the switch to AF-C should help a bunch. Even with the best equipment, using the proper settings, you will never get a 100% hit ratio. The best combo I ever shot was a D3X with the old 80-400 (AF, not AF-S) lens. With that combo I got 90%+ on horse polo. Remember AF-S on camera refers to SINGLE focus, while AF-C on camera refers to CONTINUOUS focus. AF-S on lens is the type of focus motor, and AF-S lenses are typically faster than AF lenses. Always make sure your lens is set to A/M or M/A and never to M. If the lens is set to M, then it is a manual focus lens, and it does not matter what the camera is set on. The on-camera switch to the left of the lens should be set to AF for AF-S or AF-C to work. If that is switched to M, then you are on manual focus. Many settings to get changed (sometimes by accident), so it never hurts to visually check all switches before starting any photography session, and then also to check what shows in the viewfinder. From the pictures I guess you are shooting auto-everything all the time. Not that this is a bad thing, but I don’t do it. I’m shooting manual RAW, correcting exposure misses in post. Just meter off the shirts and correct a bit when black or white. In that way you are not influenced by the changing background. I shoot in manual mode, 14-bit NEF, with auto-ISO, fixed speed and aperture. I have a problem with color because I am partially color-blind, so I do not even attempt to color correct before posting pictures. Pics printed will be color corrected by the lab. As a personal taste, I prefer full-body shots, though I do sometimes shoot partial ones. A 200 f/2 lens would result in detailed partial body shots, with more face showing, and there is nothing wrong with such, just not what I shoot (also such a lens is very expensive, and most people can not afford). These articles are written as guides for fans, parents, etc, not Sports Illustrated shooters. i Love how you support us- parents who just want to take good/clear pictures of our kids doing sports without breaking our budget. Those days won’t come back when they’re grown and i don’t want regrets later that i didn’t capture their moments. You said that from your experience the opposing team does not buy anything. While i do shoot some high school volleyball, MOST of my sales come from shooting club volleyball (which starts around January and lasts until April or May) It is the same age group (U12s thru U18s), but my company pays a vendor fee, and we sell onsite. That’s where the money is. How many people on your staff? My article, and the way I work, is for “one-man” shops, and is addressed to people that work that way, not with a crew; or for the casual fan, parent, or photographer shooting for the school paper/yearbook. Including myself, i have 3 regular shooters, and a secretary/odd-job girl/cashier. (She’s the one in the video). Frankly, selling on site will make more money even for a “one-man” shop despite the fact that you have to pay a cashier. I’ve discovered that from experience. SJH Foto…thanks…I appreciated your insight. Great article! 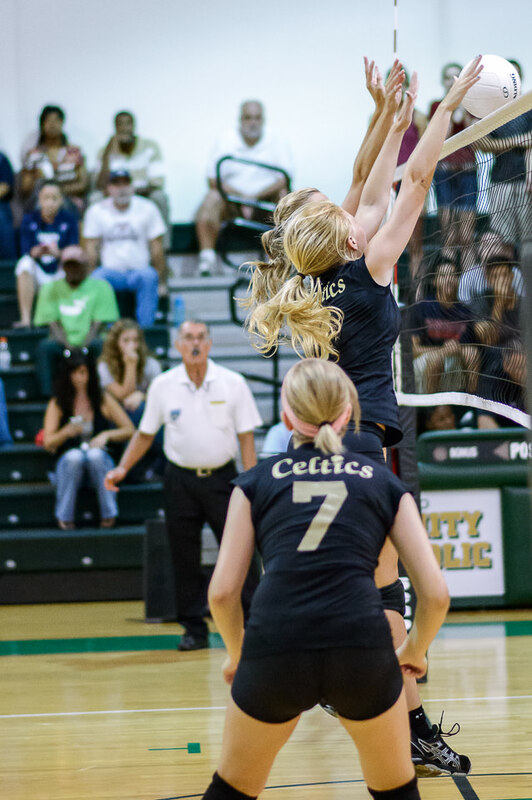 My daughter plays club volleyball, as well as high school volleyball. I’ve tried taking action shots for several years now, and just can’t get them. I have an old Nikon D60, looking to upgrade and actually take classes this time. That said, I’d prefer not to spend $2000 on a camera. Any recommendations on a less expensive camera? Obviously not a professional photographer, but I do understand the basics. Glad you enjoyed the article. I am not certain how much you are willing to spend, but will advise you can purchase used and/or refurbished equipment at discounts. You could move up to either a D7000 or D7100, which would give you some more ISO, and probably better focus. Some of the lower end cameras (D5000 or even D3000 series) would also allow you to move up. The camera rating by DxO for a D7200 is 87, with a Sport score (ISO) of 1,333; the D5500 has a rating of 84 with a Sport score of 1,438; and the D3300 has a rating of 82 with a Sport score of 1,385; so all three of those cameras are close in performance. Note: You can shoot higher ISOs then those recommended above, but if doing so it is best to shoot in NEF (Nikons’ version of RAW), and process using programs like Photoshop, Lightroom or DxO Optics (I use DxO). You should also use fast glass. Depending on your location to the players, the AF-S 85mm f/1.8 lens (which would have an effective angle of view of a 127.5mm lens), might be good. If you are sitting closer to the players, then a short lens, like the 50mm f/1.8 lens might be better. Not knowing your location, or shooting habits, it is hard to make an exact recommendation. More expensive glass (f/1.4) is better for low light, but those lenses are also very expensive. Make sure when buying to purchase USA models, not Grey Market. You can purchase from Adorama or B&H Photo. If you would like, I can provide links. Adorama has an easy return policy, so you can purchase, try, and then return if you don’t use it much and it will not work for your needs. View their website for complete info on their return policy. B&H has a similar policy, but I have always found the Adorama policy to be easier to use (personal choice). Note: Their return policy may be different on used gear, so be sure to ask before buying. Thank you for responding, and on a weekend even! I will email you separately. I went to Precision Camera, here in Austin today, and they recommend the D3300 too. Didn’t buy anything yet. Hobbyist (aka Dad) I’ve shot club and high school for five years, mostly with Canon 70D & 24-105mm f4 lens. I shoot raw and crop. No slower than 1/250. If ISO is above 3200, I sit & enjoy the game instead. I find I’m usually at 80-90mm which shooting from the side, 105mm+ from the ends. Shooting from the opposing team’s end is great for faces (blocks and attacks). Shooting from your team’s end will often get great back-row player in your foreground, front-row players attacking and covering the block. Lots of action. From the ends, I like shooting up (sitting on the floor) when I’m behind my team. When shooting from behind opposing team, I’ll try to stand 4 or 5 rows up, in the corner: That way faces tend to be above the net…. experiment, as it depends on how tall your athletes are, so the top tape doesn’t fully block their face. Don’t forget getting the celebrations after aces, blocks, etc: lots of smiles & jumping. On set points, I’ll set up to shoot wider (40-60mm) and aim at center of team. Looking to try a simpler 85mm f1/8 lens this year, so I can shoot faster in lower light.